Nawang Khechog at peace in the mountains. Nawang Khechog says he can't imagine not living in the mountains; they are where he will always feel most free. 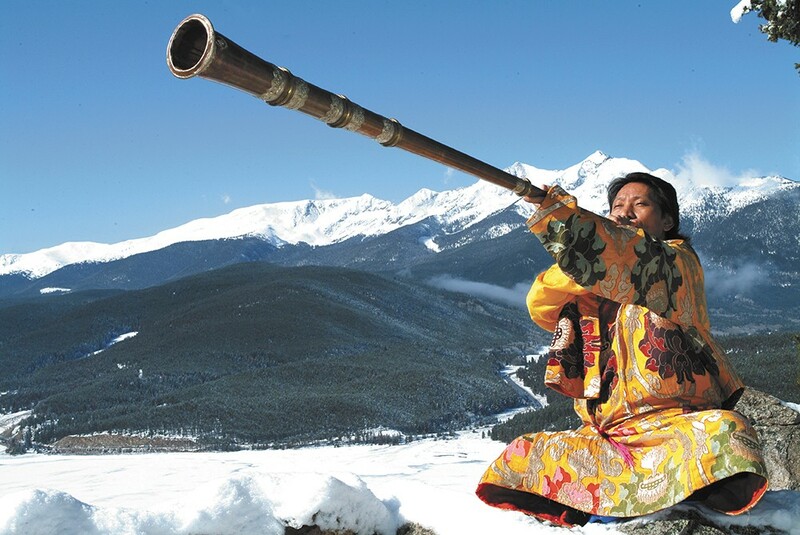 "I'm a mountain man," says the Tibetan flute player, who grew up in the Himalayas and is calling from his home in Boulder, Colo. Spending most of his life among the jagged peaks and high altitude, he's right in his assessment. He even bought a cabin in the Indian Peaks Wilderness of Colorado to emulate the decade he spent as a Buddhist monk and later a hermit meditator — living on his own in the mountains while constantly meditating — following the Dalai Lama. Living in the U.S. now for 30 years, Khechog is the foremost Tibetan flute player in the world. He's left the mountains enough to collaborate with everyone from composer Philip Glass to David Bowie, and have his music featured and even act in the film Seven Years in Tibet. Still, even though he's been nominated for a Grammy, he can't read music. "I never really had a teacher," he says of picking up the traditional instrument as a young teen. "It's all savant, it's a small blessing." Sunday, Khechog performs at the Bing Crosby Theater with Tibetan opera singer Tsering Lodoe. Before that show, as he does with his performances, Khechog will take time before hitting the stage to calm his mind through meditation. "I try to play the flute that so what comes out is quiet and peaceful," Khechog says. "And with that, people can also become more calm and relaxed — like when we go to a mountain." In early 1950s rural Tibet, Khechog's parents were told by a passing hermit meditator that it would soon be dangerous to live in the country. His family fled to the safety of India, where he would grow up. By 1959, Tibet was completely taken over by China. There are still Tibetan issues today that Khechog wants to make Americans aware of without having to preach. "Monks are burning themselves in peaceful protest," he says. "The Chinese are destroying the environment there." But Khechog says he makes a big distinction between the people of China and its government. "The people there have suffered more than those in Tibet," he says. Rather than a performance focusing on Tibet's freedom, Khechog aims to bring awareness to the issue through the notion of peace and harmony. While Khechog plays improvised music on a variety of flute and traditional horn instruments, Lodoe sings traditional Tibetan songs. His sound is chant-like and ethereal. As Lodoe describes, the music he performs is the music of the Tibetan mountains. "I share the story of what I'm going through with my voice and music so everyone feels energetic and happy," Lodoe says. Residing in Missoula, Mont., Lodoe arrived in the country in 2010. He says he moved here to promote the culture and tradition of Tibet. As a teenager, he began studying at the Tibetan Institute of Performing Arts in India, working to the highest levels of the Tibetan opera craft, which he says is far different from Western opera. He has played for the Dalai Lama and Pope John Paul II and also was featured on the Seven Years in Tibet soundtrack. When Khechog came to perform at TIPA decades ago, Lodoe says he always imagined the pair would play together. Sunday, they will for the third time.